This is an idea for a fan expansion I've been thinking about for a while. The basic themes are "a sudden, big effect" and things that happen when you shuffle. 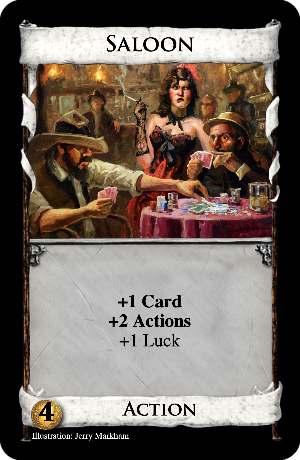 Some of the cards also have a Wild West theme. It has some new mechanics. First, it has the Luck Tokens I invented for the weekly card contest. 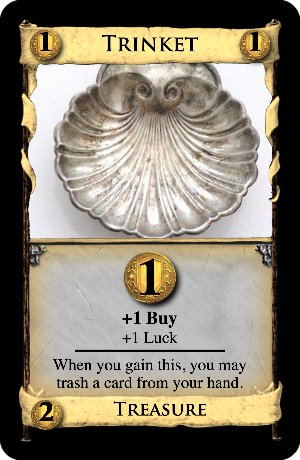 I had actually come up with these tokens when I was thinking more about this set than the contest, and they serendipitously worked as an entry. For those who didn't read the thread, "+X Luck" means you gain X Luck tokens, and you spend Luck tokens when you shuffle. For each Luck token spent, set aside a card and then put it on the bottom of the deck after shuffling (in any order if you set aside more than one). There are some cards with overpay as well. The most important, though, is the new Jackpot card type, indicated with a bright green color. If a card has the Jackpot type, that means it has a special ability, indicated with the text "Jackpot: ". When you play a card as a Jackpot, you do not get the card's normal effect, and get the Jackpot effect instead. There is basically one important restriction with Jackpots: You can only play one per turn. Once you play a card as a Jackpot, you can play other Jackpot cards, but you can only use their regular abilities. When can you use a Jackpot? Anytime on your turn except during cleanup. You can use it at the very beginning of your turn, before you resolve any lingering durations, or you can use it at the very end of your Night phase, or anytime in between. It does not use up any actions, the only restriction is once per turn. Also, these rules only apply if you're playing a Jackpot card as a Jackpot. If the card's other type is Action and you play it as an Action instead, the normal Action card rules apply instead. So here are the cards (more coming.) I'm pretty clueless as to whether or not these are balanced, so any feedback is greatly appreciated! A great example for how you can use (or abuse) the Jackpot mechanic. Play a Cultist and immediately trash it for +3 cards, or get a Monastery effect by playing it after your Coppers. Use the top decking to replay the same card, or set up your next turn. Lots of possibilities. By the way, I came up with the top decking thing before Eagles posted about his similar Heir card. This has the same tracking problems, but I might find some way around that. Note that the Jackpot says "card", not "Action card". 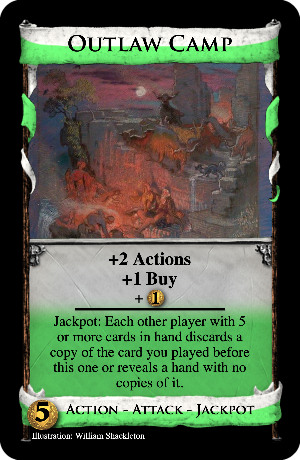 Since you can play Jackpots at any time, there's no need to limit the King's Court effect to Action cards; you can use it on Treasures or even Night cards! A cute idea I came up with. It's like Council Room or Governor, but then you can force them back down to 3 cards. The attack is also the Jackpot, so you can use it after playing another with the Action effect even if there's no +Actions on the board. The net result is only +2 cards, of course, but hey, you also got +Buy and attacked everyone else. It's an attack village! 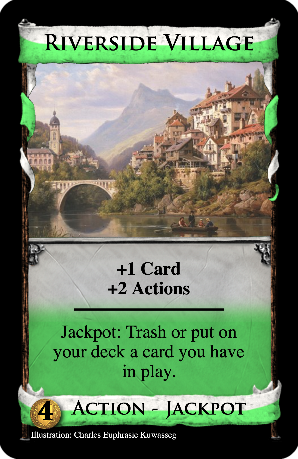 You can potentially force them to discard anything thanks to the play-anytime Jackpot rule, but the village effect itself is pretty crummy, so you decide if it's worth it. Card from the contest, with a minor change. 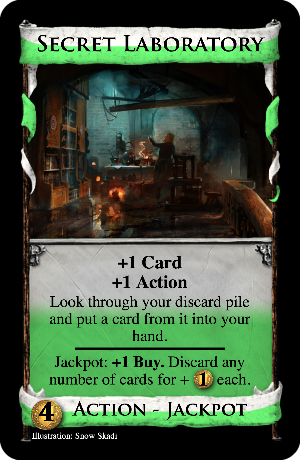 Similar to Ducat, but I like the idea of a slightly-better card you can replace your Coppers with, to maybe make Remodeling easier. Another contest card. Curses everyone, but at least they can make the Curse miss a shuffle. 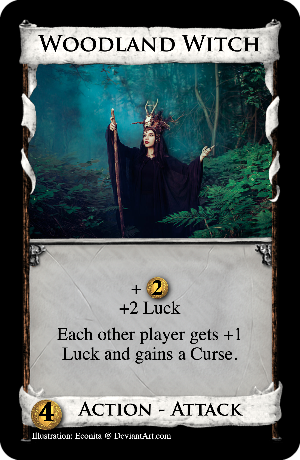 Originally it was going to be "+$2, +1 Buy" with the name being a nod to Woodcutter, but I felt, hey, if this is a witch that hands out Luck for some reason, why isn't she giving you any of it? 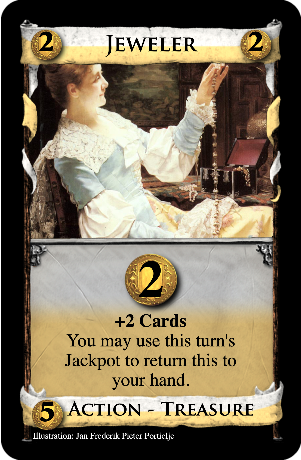 The last contest card, again with a minor change. You can use the Luck to make this dead card miss some shuffles, or just trash it and use the Luck to bottom-deck the Gold. A card from another contest. 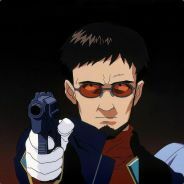 This was an idea I came up with a long time ago, but it has overpay so it fits here just fine. Yup, it's a $2 attack! It's also something that cares about shuffling. Instead of giving you Luck tokens, though, it gives everyone else bad luck. It has to be weak given the price, but is it too weak to ever buy? Dunno. And here's the Treasure-Jackpot I promised. 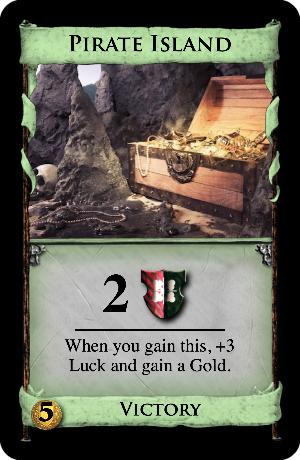 Directly inspired by Leprechaun, one of my favorite cards, but Treasures and Nights will also count toward the 7 here. More crazy colors! 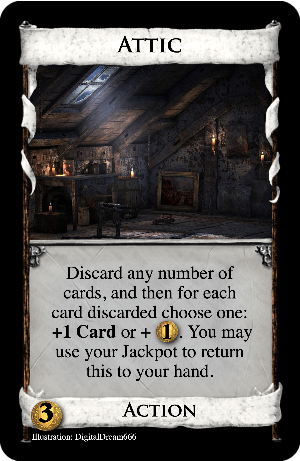 The Jackpot is a bit convoluted, but I wanted something that you wouldn't obviously want to do at the beginning or end of your turn, so it has the Lab-Discard-Wharf thing. A lab variant with a nod to Secret Chamber. It's not a Reaction but it could be a reasonable defense to discard and junking attacks. Another wacky effect. Empty your hand of all Treasures and Nights, then return to your Action phase and draw back up to 5. It's the infamous Road! But you can't play it infinite times, at least. Note that while it can use your turn's Jackpot, the card itself does not have the Jackpot type, so you can only play it during your Action or Buy phases. If it's not clear, you get the $2 and nothing else if you play it during your Buy phase, and you get everything under the $2 but not the $2 itself otherwise. And you can't use any Jackpots if you do the return-to-hand thing. I made it an Action-Treasure so that the return-to-hand is still useful even if there's no villages. Same principle as the last one. More boring than the others? Eh, it's a village and it helps your engine consistency; it works. Another old idea. Sift, or "reverse-sift" before trashing your hand. Edict mechanic from Asper. 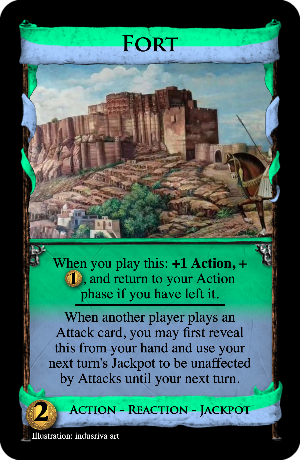 I wasn't planning on having any landscape cards originally, but then this silly idea came up, and I think having some when-you-shuffle Edicts could be cool. 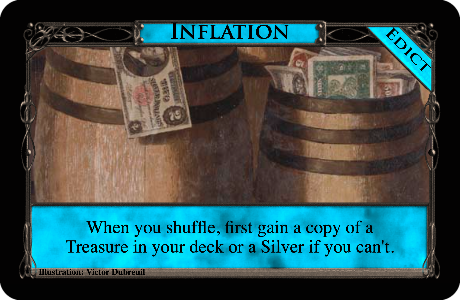 This was originally going in RBCI, but the more I thought about it, it might actually be fun to have a deck where your Treasure is constantly multiplying. Might lead to some nice TfB tricks, or a combo with a good Kingdom Treasure. What do you think? Another overpay card. The on-play is weak, but getting rid of some of those $0 cards can get easier if you use the overpay to replace them with 2s. And of course, you can also use the overpay to get some extra points or empty a pile at the end. It's like VP for overpay but not broken. New card, with a new color combination! The basic ability is pretty bad: Copper as an Action. 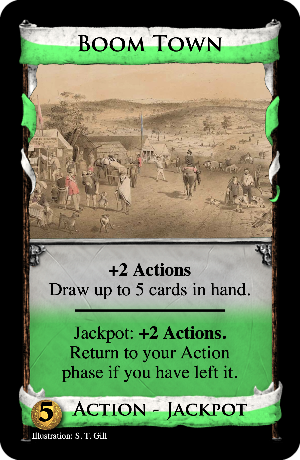 The Jackpot ability gets a bit more exciting: you can get a Village effect, or return to your Action phase if you draw it dead. And then there's the Reaction part, of course: Stop Attacks cold, at the cost of next turn's Jackpot. Which will you choose? This is an interesting idea. I'd choose a different colour though, green is too Victory-ish. Riverside Village looks OK. Mid-turn Scheme-ing (at the cost of not-drawing, unlike Scheme the Jackpot option isn't a cantrip but just a non-terminal) is also interesting. Royal Blessing is far too good. 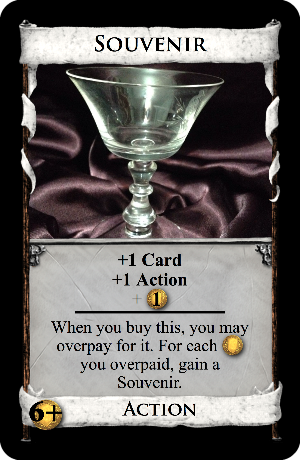 We know from Crown that you often don't mind paying $5 for a Throne Room anyway and while you are restricted to one King's Court per turn and cannot pull off something like KC-KC-... the KC option is non-terminal, i.e. you could play Royal Blessing - Smithy for a hand of 12 cards without having to spend an Action. Travelling Salesman looks too automatic. It is like having a guarantee for having Urchin/Miltia always alongside Council Room. It is also too cheap. Riverside Village is really cool. Royal Blessing is definitely too strong. I think this wording should fix it: The next time you play a card this turn, you may play it three times. This way it uses an action, to avoid doing what Holunder said. I think Travelling Salesman should probably cost $4. Outlaw Camp should probably be changed somehow; The village effect is the same as Villa, and I think the reusable Jackpot ability is a good bit stronger than Villa's on-gain ability. I think that Trinket can lose the 'When you play this' wording, based off of Pouch. Woodland Witch, Pirate Island, and Black Cat all look good. Really cool mechanics and cards! Neat mechanic. So for clarity a Jackpot card doesn't have to also be an Action, right? You could have just Jackpot, or Victory-Jackpot, etc? When you play a Jackpot, it counts as "playing the card", right? That's not immediately obvious, and matters for reactions like Moat. Royal Blessing seems fine except perhaps the not limiting of card types. So you can play a Curse 3 times? You can play a Victory 3 times? It's weird. If it's not too wordy, it would be good to say "Action, Treasure, or Night card". Or just keep it as "Action or Treasure", since Night only exists in 1 specific set. That shouldn't be necessary. Compare with bonfire that have the same wording to exclude estates and curses. I don't see how this card allows you to put those categories into play? Edit: got the wrong card, confused it with riverside village, nevermind. Bonfire only refers to cards that are "in play". Because there is no way currently to get a only-Victory card in play, Bonfire doesn't need to worry about it. But Royal Blessing says to "play a card". This is giving you specific permission to play any card in your hand, which can include an only-Victory. I don't think this breaks any rules per-se, and you would just have to assume that when you play a Victory card, you simply don't do anything. But the card still gets in play, and it would still cause confusion. Thanks, that's a really good idea. I'll do that, but maybe tweak the wording to "you may play it again twice." Come to think of it, that wording solves all of the other problems too. It means the cards all stay in their own phases, and you can't play unplayable things like Curses. Traveling Salesman: Honestly, I'd make this $4 but I feel it compares pretty badly to Smithy when there's no villages. Perhaps I'm wrong about that though. It also seems less interesting to me if it's the same price. Maybe I could take away the +Buy. What if it were discard down to 4 instead? What do you mean by "reusable" Jackpot ability? The whole point of Jackpots is that you can only use them once per turn. You can use the same Jackpot again next turn, but that's true of all the Jackpots. Are you saying the attack is too strong? Correct on both counts. I have a Treasure-Jackpot I'll post sometime soon. Now that I think about it, it appears that you could also use the Jackpot ability when another card tells you to "play" it, like Throne Room, since those cards only tell you the type of card you can play, not how to play it. 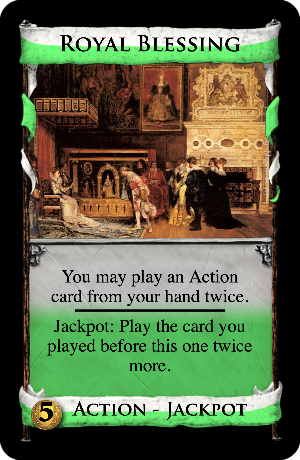 Though in Throne Room's case, only one of the plays can be the Jackpot, and the other has to be the normal effect. Yes, I just mean that you can (possibly) use the Attack part of Outlaw Camp is, in my opinion, much stronger than Villa's on-gain ability. 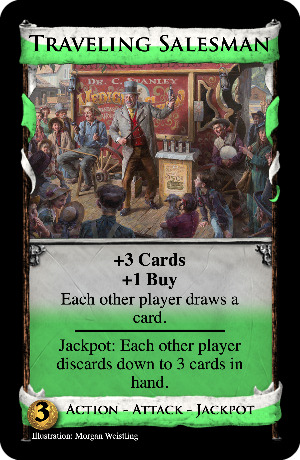 Regarding Traveling Salesman, I don't think it compares poorly to Smithy at all, however if you remove the +Buy I think it could work at $3. Also, realize that any Jackpot card is fairly strong just for having a Jackpot ability, similar to Night cards, since it's harder to draw them dead. I agree that you should change the jackpot color. 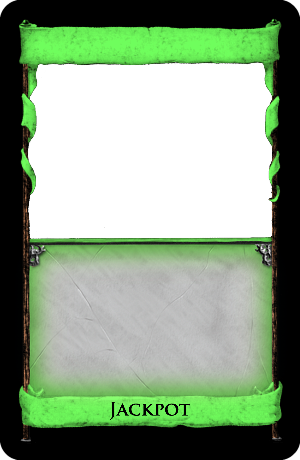 Also, a tip for VioletCLM's card image generator: don't put a space between the "+" and the number; it won't auto-bold with the space. For example, it would bold "+2 Cards" but not "+ 2 Cards"
I agree that travelling salesman is too strong. You can just buy tons of them as your only draw, and use one jackpot ability at the end of your turn. And it only costs ! I think it would even be too strong if the jackpot only made people discard down to 4. It possibly could work at or maybe it could stay where it is if you made the jackpot say "Trash this. If you do, each other player discards down to 3 cards in hand"
I do think the card is pretty clever and fun though. You only missed this a couple of places, namely Outlaw Camp, and while you're at it, +1 Buy goes before + $1. More cards for you to look at. Also, changed the way Royal Blessing works, a bit. Bumped Outlaw Village up to $5. 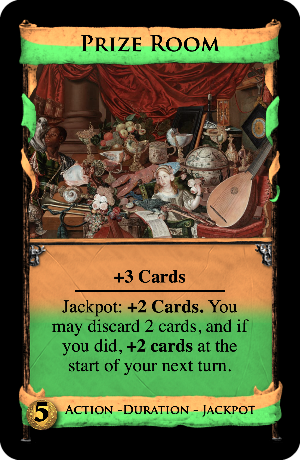 Removed "When you play this" from Trinket; it seems that +1 Buy could occur by itself on Contraband all the way back in Prosperity v. 1, but the rest of the text needed "When you play this". Does anyone know why Treasures need that text? I'm still thinking over Traveling Salesman. About the color, I'm reluctant to change it because I really do love this shade of green and it matches the "luck" theme really well. All of the basic colors are taken, too. Asper grabbed Pink for his Seasons and I don't want to step on his toes. I could use some sort of Teal, but I think that "Tribes" fan mechanic uses that. Pot of gold is going to be way to easy to activate for how huge that reward is. You could try some sort of subtle alteration of the regular card banners. That's what I ended up doing for my Commander cards and I think it turned out good. You'll need some sort of photo alteration software though. Or the Green-Yellow space appears different enough to be unique and I don't think anyone has a claim on it. Here is a side-by-side comparison. Note my Victory card green might be slightly off. 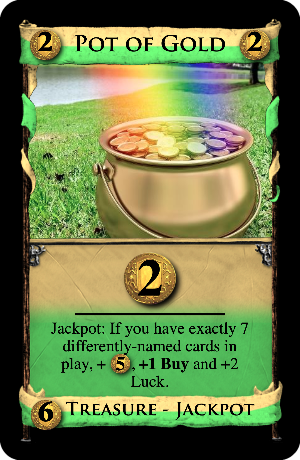 Pot of Gold seems good, strong but not too much, even $4 cards can give you +$5 like Death Cart, so this seems alright, but it's worth noting that if you are counting Night cards, you have left your Buy phase and the $5 doesn't help you, only the Luck does. I think Jeweler needs some kind of 'If it's your ___ Phase' wording, unless you want it to be that you can play it in either your Buy phase or Action phase and always get +$2 and +2 Cards. But it gives $7, +1 Buy, and + 2 Luck. 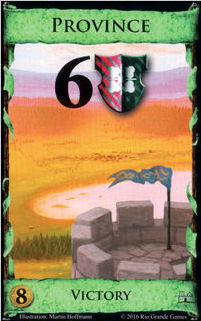 And with treasures and night cards able to help you get to exactly 7, this won't be hard to activate. Now this jackpot is a mechanic with potential! And you've used it in effective ways so far. Riverside Village is neat. You could use scheme's wording for the jackpot effect to avoid Duration confusion, but that won't let an immediate Action replay happen. 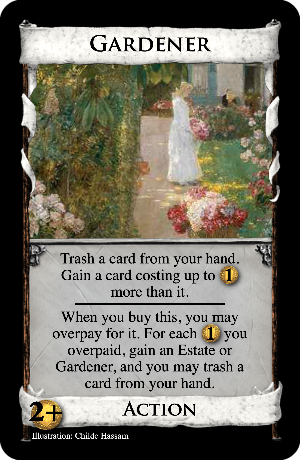 So "choose a card you have in play that would be discarded at Clean-up. Trash it or put it into your deck" would be my best suggestion. Is Royal Blessing doing royal carriage twice on anything you have in play? I like how the jackpot is used here, and we can play Actions in the buy phase now so tracking and rules are fine, but: I'll emphasise again that this feels too strong. Buying a KC for $5 would be pretty automatic, even more so a tripling Crown, but even more so again a royal carriage variant that can be drawn later so it doesn't need to connect to a target in hand. Even with only one allowed in the deck I think it should cost at least $6. You said when you changed this last that it was to use an Action when you play an Action card. This wouldn't do that as what makes KC use an Action is playing itself during the Action phase, which jackpots will never do. You'd need to specifically say "if you have any unused Actions, use one to..."
Outlaw Camp is either a villa or a narrower raider. The niche attack fits a jackpot well, but using a jackpot to purely Attack might put some people off. Could it cost $4? I've never played with raider, so it might be $5 strength. 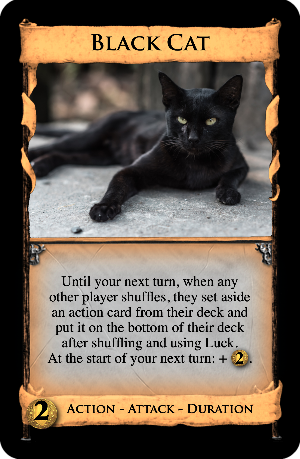 Black Cat would have the next turn bonus after the attack text and there be no line to match Enchantress. It can completely miss its attack so be very weak indeed. Playtesting will tell. Prize Room can draw cards at any phase, which is a nice feature. A safe and effective design. 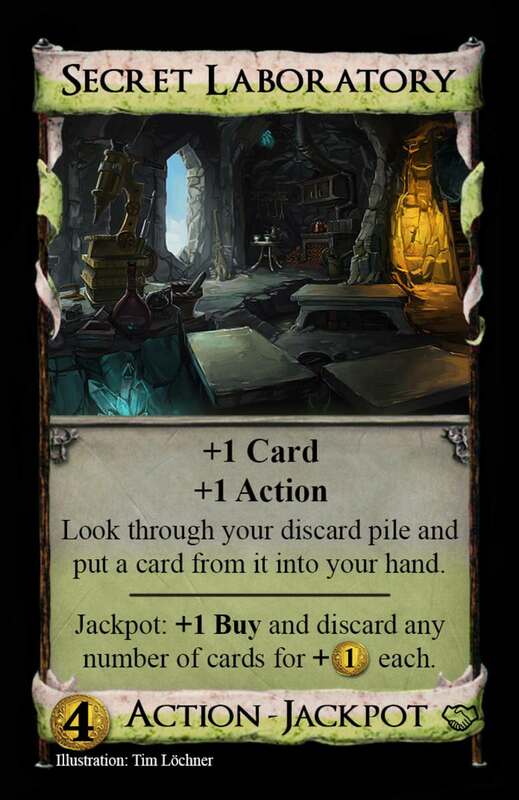 Secret Lab - cards from the discard can be advantageous in choosing what you get, as well as disadvantageous in sometimes missing. Even considering the draw you get first potentially triggering a reshuffle, this might still be a $5, with the jackpot option? Playtest at $4 and see I suppose. For Jeweller, I agree to FEF's format suggestion. This would make a simple and elegant card that feels balanced. Attic I'm puzzling over a bit. When would you jackpot this? Going for full draw first then $ like storeroom, so you keep a good handsize the second time? Would that be a worthwhile 2 Actions? Putting +1 Action on might help, or might make it too strong, or be too like Secret Lab. Saloon is fine, but you have a fair number of villages in the set already. If you were to take one out I'd say the top of Outlaw Camp. Accountant should be fine, may need to cost $3 but let playtesting tell this. And for formatting the jackpot type (thinking if you should make a Victory Jackpot), you could try the extra custom colouring on the simulator to maybe make the corner parts under the picture green, or the banner poles at the side green? It may not be visible enough. It doesn't use an Action to play Royal Blessing, but it only replays a card you already used an Action for, instead of having the Royal Blessing itself play the card. Keep in mind that you don't have to play it again immediately after it returns to your hand. In fact, I specifically designed this so that the return-to-hand plays differently than just Throning it. 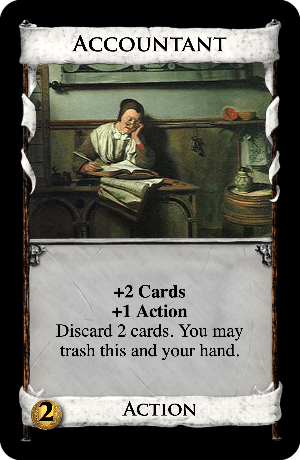 A more effective thing to do might be to use it to sift, then use other cards to draw before sifting again. Or discard stuff for $, then play a draw-to-X card, then discard stuff for $ again. Here are some options for colors. I'm pretty set on it being some shade of green, because nothing else feels right with the "luck" theme. The first is the Victory color for comparison. The second is the current color. The third is a brighter green. The fourth and fifth are more tealish. That Tribe thread seems to be dead so I'm now thinking these wouldn't be a problem. Yeah, the Victory colour on the generator is different enough to your current jackpot green, so if you did make a Victory Jackpot like this it would be clear. I just question if the generator colour is actually Victory green - the IRL cards are more vivid. Still, of the 5 colours, I would say the third is best, most like a clover? I may well work more on the Tribes set in the future, it's only been ignored because I've been working on Revolution instead. Hmmm... This is way too close to the current color I'm using. I'll likely have to change it to the brighter green. Though I'm starting to like the more green-ish teal color I posted as well, and I think that color is noticeably different from the Tribe one. In light of Scepter's introduction, Royal Blessing has been changed again. It now fully keeps Actions, Treasures and Nights within their own phases, which I like. Black Cat's wording has been changed to match Swamp Hag's. This looks like a variant of Asper's Subventions. I like that you can copy powerful Treasures like Colony or Fortune but dislike that you are forced to take at least a Silver.